Deb's Cup of Tea: Momma and her kitty. I staggered out of bed on this impossibly gorgeous morning and someone wanted my lap. Both have followed me around since I returned from my overnight to Iowa. I guess it's to make sure I'm not going anywhere. Pilchard's not one to be picked up. She allows it or, if I'm swift, reluctantly agrees to be cuddled if I catch her. But the past two days, she wants to be in my lap. When Carole and David were here, she actually demanded my lap. This was quite the event and I had Carole document this. Some day, I'll get a photo of myself and Mija. 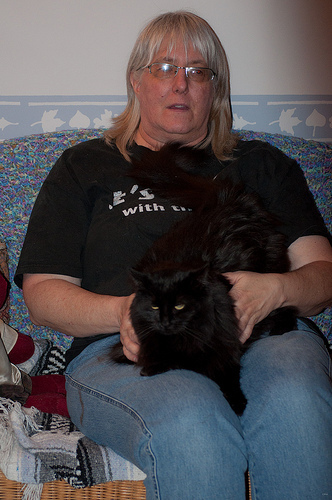 Memo to self: Next time, don't wear a black tee shirt while holding a black cat.